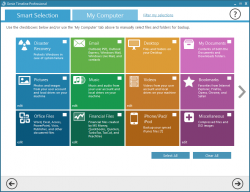 dotTech has a review on best free backup software for Windows . Pick any of the file-level backup programs mentioned in that review, and you will be able to successfully and happily backup your files. However, the freeware programs we mention in our review do file-level backups but nothing more. Genie Timeline Professional, on the other hand, offers file-level backup and more. Let’s see if it is worth your time. Genie Timeline Professional is a file-level backup program that allows you to backup and restore your files. However, the selling point of Genie Timeline Professional is that it goes beyond just backup — it is a file versioning tool that keeps track of different versions of your files and allows you to easily restore an older version of your file(s) as opposed to just restoring the latest backed up version. Take note Genie Timeline has three versions — Free, Home, and Professional. If you want to know the feature differences between the versions, click here (PDF) . This review is specifically on Genie Timeline Professional. ‘Smart Mode’ ensures Genie Timeline Professional automatically adjusts computer resources usage when your computer is in use so as to slow down your computer. ‘Turbo Mode’, alternatively, let’s you tell Genie Timeline Professional to conduct the backup regardless of if the computer is in use, i.e. ignore computer resources being used by other programs. ‘Game/Movie Mode’ tells Genie Timeline Professional to automatically pause backups when you are play games, watching movies, or running presentations. Take note by default Genie Timeline Professional has Game/Move Mode disabled; you need to enable it manually if you want it. Power Saving Mode is enabled by default, and by default Smart Mode is used — you need to toggle Smart Mode to Turbo Mode if you want Turbo Mode. ‘Advanced Restore’ is basically the same thing as Timeline Explorer except it is accessed from within Genie Timeline Professional and is more of your traditional file restoring process (i.e. select files, enter password if necessary, select restore location, and hit restore button). Like Timeline Explorer, you can view all file versions with Advanced Restore. The Linux-based bootable CD/DVD/USB is a separate 103MB download from the main Genie Timeline Professional program. This may annoy people but, in my book, is a very smart move because it makes Genie Timeline Professional itself a 13MB download and anyone who wants to use the bootable CD/DVD/USB can download the extra 103MB. 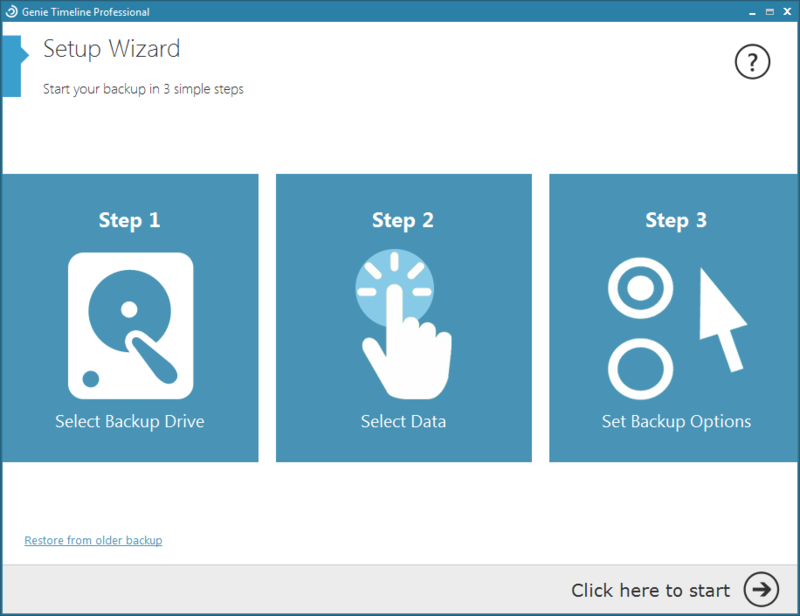 You can only setup one backup at a time with Genie Timeline Professional; if you want a new backup, your previous backup job is deleted and your backed up files are deleted if you use store the new backups in the same location. For example, let’s say you set Genie Timeline Professional to backup your only ‘dotTech is cool’ folder. Then, later on, you decide you also want to backup ‘My Documents’. You can modify your existing ‘dotTech is cool’ backup job to also backup ‘My Documents’ or you can delete your existing ‘dotTech is cool’ backup job and create a new job to backup ‘My Documents’, but you cannot have two concurrent backup jobs that do ‘dotTech is cool’ backup and ‘My Documents’ backup separately with different backup settings. Note: The main selling point of Genie Timeline Professional is to set it and then forget it — the program automatically takes of all backing up in the background without you having to do anything and without the program slowing down your computer. However, the reason there are two modes available — Smart Mode vs Turbo Mode — is so people can manually trigger Turbo Mode to make Genie Timeline Professional ignore restraints on computer resource usage and to backup files faster. However, even in Turbo Mode Genie Timeline Professional backups up very slowly. Supports iDevice backup but what about Android, Windows Phone, and BlackBerry backup? Supports ability to backup Outlook, Outlook Express, and Windows Mail emails — so what about Thunderbird, another popular client? 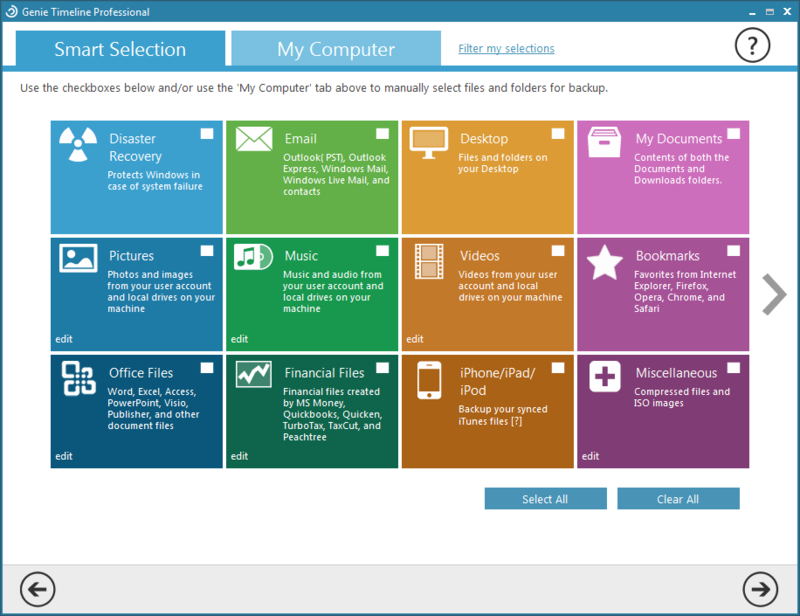 Has the ability to backup ‘Disaster Recovery’ files (“Windows folder, Program Files, Program’s data, and User folders” are backed up with this feature, according to the Help file) and has the ability to create bootable media which might mislead users to think this can be used as a system backup program. This is a misconception. Genie Timeline Professional is not a proper drive-level/system-level backup program and should not be used as a replacement for a proper drive-level/system-level backup program. Note: The main attraction to Genie Timeline Professional is file versioning and automatic backups, so to say they cannot be disabled is somewhat stupid. However, this should still be mentioned for the sake of those people that want to be able to disable file versioning/automatic backups — they then know they shouldn’t get Genie Timeline Professional. Genie Timeline Professional is a file-level backup program that focuses on two things as its main attractions: ease-of-use and file versioning. The develop touts “3 step configuration” as a feature of this program and indeed this holds true; literally within three steps (selecting ‘Backup Drive’, aka the drive or folder you want to store your backups in, selecting the data you want to backup, and selecting if you want to compress or encrypt) you can have a backup setup and going. Once you have a backup setup, Genie Timeline Professional handles all the backing up procedures in the background; it does backups intelligently to ensure it does not slow down your computer (vis-a-vis the different backup modes it has, e.g. Smart Mode and Game/Movie Mode) and backups are conducted automatically every 8 hours, although you can modify automatic backups to occur at a different interval, if desired. Take note, because it does automatic backups, Genie Timeline Professional is an “always on” program but does not consume huge amounts of CPU or RAM. In fact, Genie Timeline Professional is extremely good at minimizing CPU/RAM usage. As per my tests, while it is idle RAM usage of Genie Timeline Professional is less than 5 MB and CPU usage is at or almost 0%. While a backup is happening, RAM usage jumps a bit higher but never passed 50 MB for me and CPU usage is always less than 5% — even in Turbo Mode. In other words, if you are worried about Genie Timeline Professional being a computer resource hog, then don’t worry. The other main feature of Genie Timeline Professional is file versioning. As files that you have set to be backed up are changed, Genie Timeline Professional monitors and records those changes. Then the next time Genie Timeline Professional runs a backup (based upon whatever automatic backup settings you set — it is every 8 hours by default but can be as fast as every 3 mins), it backs up the newly modified file but still keeps a copy of the old file. When you go to restore files, you have the ability to pick which version of the file you want to restore. You can also preview different versions of files without restoring them via Timeline Explorer. The biggest issue I have with Genie Timeline Professional is it only allows for one backup job at a time. If you want to have separate backup jobs running concurrently, Genie Timeline Professional is not the program that will do it. Not having ability to do multiple backup jobs at a time is a huge pity because it really minimizes the usefulness of a program that otherwise has great features. Aside from that, I want to mention that I ran into a bug while testing Genie Timeline Professional. You see I wanted to see how Genie Timeline Professional does when I store a back up on an external drive and remove the external drive. In that regard Genie Timeline Professional performs well; it is smart enough to detect when an external drive is no longer available and automatically pauses backups. When the external drive is plugged in again, Genie Timeline Professional automatically enables backups. However, I noticed Genie Timeline Professional was identifying the backup drive by its letter (G:/ in my case). This got me thinking: What if I had another external drive with the same drive letter — would Genie Timeline Professional be able to tell it isn’t the correct original backup drive or will it simply backup to the other external drive without breaking a stride? As it turns out, Genie Timeline Professional does a bit of both. You see when I inserted the other external drive with same drive letter, Genie Timeline Professional detected the other external drive as if it were the original external drive 9the one which I set the backup to happen on) and resumed the paused backup process, which is an epic fail. However, when it went to actually backup files on the other external drive, Genie Timeline Professional popped an error telling me “Backup not configured” and wouldn’t actually backup any files, which is good because the proper drive was not inserted in my computer. Unfortunately, what happened after is a bug in Genie Timeline Professional. You see after doing all what I just mentioned, I inserted the correct original backup drive. Genie Timeline Professional detected it but would not properly conduct the required backup — it was stuck at the ‘Adding’ stage. I had to manually go to ‘Manage data selections’ and reconfirm the files I want to be backed up (and easy two-click process) before Genie Timeline Professional would start to backup my files on the original backup drive. This is a bug the developer needs to fix. Genie Timeline Professional is a niche offering; it is a file-level backup program that specializes in ease-of-use, automatic backups, and file versioning. And it delivers on these promises. Overall, it is an excellent program. So do I recommend it? It depends. My biggest problem with Genie Timeline Professional is the inability to have multiple concurrent jobs. It isn’t hard to imagine people wanting to be able to run separate jobs at the same time and Genie Timeline Professional not being able to do that really hurts the program. In my opinion, it is hard to justify a $59.95 price-tag for a file-level backup program that only does one job at a time — even if it supports file versioning. As such, my recommendation is along those lines. If you feel you won’t be bothered by the inability to support concurrent backup jobs, then grab Genie Timeline Professional. If you feel you will be bothered, then look elsewhere. As for price? I’ll let you decide if the price is worth it. I personally feel $59.95 is too high but, as I said, this is a niche program and sometimes niche programs cost more than mainstream ones. 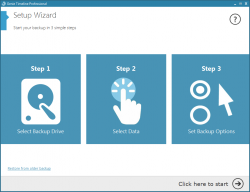 Everyone that wants file-level backup capability for free and doesn’t mind not having file versioning, check out our review on best free file-level backup program for Windows .